The ordeals that those serving in the military go through often follow them home. Returning veterans must face the challenges of the emotional and psychological trauma that accompanies military combat. 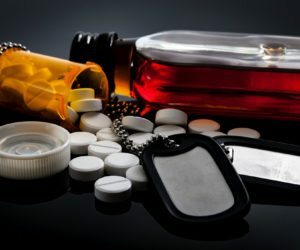 In the absence of proper diagnosis and treatment, many veterans turn to substance abuse in order to treat the symptoms of post-traumatic stress disorder (PTSD). As they continue to abuse a substance, the repeated use forms an addiction. At this point, the best way to move forward is to seek veterans substance abuse programs. The U.S. Department of Veterans Affairs collects data concerning veterans and substance use disorder – the scientific term for substance abuse and addiction. According to their findings, more than 20 percent of veterans who suffer from PTSD also have substance use disorder. One in three veterans who seek veterans substance abuse programs are also diagnosed with PTSD. Further PTSD and substance abuse statistics reveal that those veterans who suffer from alcohol problems and PTSD usually partake in binge drinking. The binge drinking is a result of the veteran trying to deal with the bad memories they have about their time in service. When people go through an experience such as the violence and death that are common in war, they can have lasting memories about the experience that are difficult to deal with when they resurface long after leaving the war zone. The experience they had can result in the person being trapped by their bad memories. Each time they have an episode, it is as if the event just happened due to the severe effects trauma has on the mind. A person with PTSD may avoid places, people or activities that remind them of the traumatic experiences they had. They may do it knowingly or instinctively. In many cases, this avoidance can lead to disruptions in their life on a daily basis. When they experience the bad memories, it comes as flashbacks that are intrusive. It can cause insomnia and when they have an episode during the day, it can cause a severe impairment as the flashbacks can be overwhelming. The person may find themselves constantly on alert or on edge. They may be easily scared and overreact to stimuli. It can make the person very difficult to deal with too. When there is substance abuse accompanying PTSD in a veteran, it is important to seek out veterans substance abuse programs. Rehab centers that provide veterans’ treatment programs are able to treat a dual diagnosis – a diagnosis that indicates that there is a mental disorder as well as a substance use disorder. In these cases, both mental disorder- PTSD and substance use disorder – must have simultaneous treatment in order to achieve long term success. For example, in veterans alcohol treatment programs, both the alcoholism and the PTSD must be treated separately and simultaneously so as to avoid relapse. In a veterans alcohol treatment program, if only the alcoholism was treated, it is likely that the symptoms of PTSD will cause the person to turn to alcohol or drugs so that they can self-medicate again. Addiction treatment programs for veterans are the best way to tackle the problem of PTSD and substance use disorder. Dual diagnosis treatment is a proven way to help veterans with PTSD quit alcohol and drugs and find the right kind of treatment to effectively deal with their PTSD symptoms.